Each year innovation is pushed to new heights for new iOS music apps. Some years and some apps more than others. 2013 has been a strange year to me, in many ways personally, but also in regards to what I’ve seen in music app development. Not bad or anything, but it felt incomplete to me. Maybe? It seemed like this year had been a little weak. Maybe not? Could be simply that some things just didn’t get finished in time? Well, I am familiar with that having delayed my own work a few times to the point where my album “Chapters” can’t be released until a few weeks into 2014. I get it, stuff happens. The thing I think was most glaringly missing in the iOS music app world was not one new, innovative iDAW. I sincerely expected to see something new this past year. Nope. Well, yes there were a couple new iDAWs released but sadly none were even close to being half as good as what already exists. Nothing that was breaking any new ground, or offering any new options. Total lack of innovation in this category for 2013. There is no shortage of excellent iDAWs to choose from, just nothing new worth celebrating. We did see some huge changes in how we can make music. Inter-App Audio arrived with iOS 7 (and a few bugs) and took the way we record and connect our music apps to a new level. Much remains to be seen, but it’s definitely headed in the right direction. At least we can now record at industry standards with IAA supporting 32 bit floating point, depth. This won’t matter much to a lot of people, and for many reasons. It does matter to me, but the reasons for that go way off topic. Let’s just leave it at that. Cool? So it hasn’t been a silent year, or a disappointing year. Just a bit odd. Nevertheless, several innovative, excellent, and exciting new music apps did arrive in 2013. That all said, the following is my take on the best new music apps released in 2013. I think I covered this topic, there were none to speak of. “STIX Electronic Drum Synthesizer” by, Alexander Smith. This category is always thin compared to the rest. For me this was the most interesting and innovative. This fell into my hands a bit late. The original Electrify was an app I bought a long time ago (relatively speaking) but never bonded to. Electrify NXT is a whole new thing. Despite some reports of continued stability issues, I still choose Electrify NXT as best in the category. This app has a lot of good things going for it. Sequencing, sampling, looping, and a built in FM synthesizer. Loaded with effects, factory loops, and everything you need to mangle it all up. Electrify NXT is loaded with features and functionality. 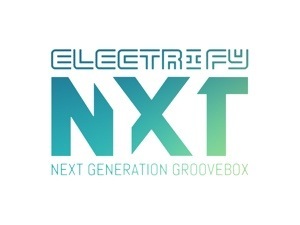 Compared to the other candidates in the “Sequencing” category, Electrify NXT is most useable as is. Not to mention it’s far more intuitive and easily understood. Auria may have the best mastering plugins and automation to make the job very detailed, but you’d have to spend an arm and leg to get them. This app has an excellent set of tools to master your final mix, including multi frequency stereo imaging. This is a budget mastering option, but it doesn’t sound like it. I find myself using it most of the time. It just needs automation. Here we have a fun and trippy flanger/fuzz effects stand alone app. 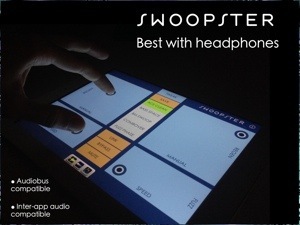 Independent channels, or linked, fuzzy, or flanged, or throw it all on the mix, Swoopster delivers. 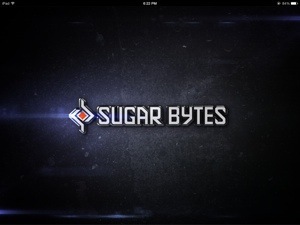 It’s been a great year for iOS Synthesizers. Choosing a single “best” synth was giving me indigestion. So I choose the two I find myself going to constantly and could not live without. A super strong entry in the growing wave table synthesis category, developed by Waldorf and Tempo Rubato. Create, and tweak your own wave tables from recordings and even a nifty text to talk feature. 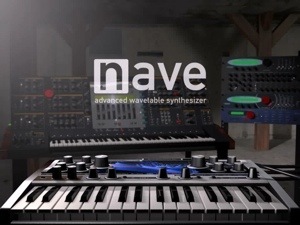 Hefty routing options and extremely versatile make Nave one massive synth. VirSyn took additive synthesis and sound morphing to a new level. 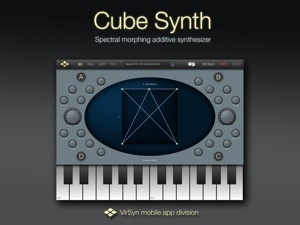 Extremely detailed parameter controls, tons of powerful sound designing tools, and oodles of interesting and endless combinations make the Cube one of the greatest iOS synths ever. Very underrated I think because so much of its power is not made obvious, but it’s all in there. Why is a reverb app most needed? Well, it is my opinion that reverb has been a weakness in iOS music for too long. Sure Auria has a few excellent choices, even a fantastic Convolution Reverb, but what about non Auria users? Nothing? 2013 was the first year we had a few excellent reverb stand alone apps show up. VirSyn delivered the most impressive sounding of the bunch. 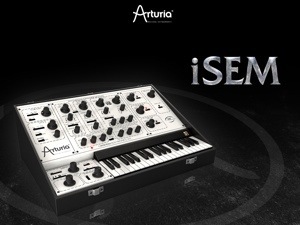 It uses a remarkable algorithmic reverb with the high quality impulse response (real reverberations) recordings to combine for a very natural sounding effect. It doesn’t sound like an effect laying on top of something artificially. It sounds like a natural part of the music. That is something iOS music has been missing for a long time. No more suffering with “FreeVerb” or other cheap algorithmic knock offs. A quality option is here. I may not be the biggest fan of organs, or even really have a complete understanding of them but I know when something just sounds great. Yonac Inc crafted this organ for iOS to have a sound that is emulated perfectly. They took an old time instrument and added modern extras, FX, and tools to make this the most impressive organ emulation I’ve ever heard. Some friends of mine who are organ aficionados schooled me on the topic, and insisted I not leave this one out. I wouldn’t have, but thanks anyway guys. WHAT? Really? Yes! You can have some of the most amazing synths, drum machines or whatever’s, but if you intend to complete, polish, and make your production sound it’s best, you must have a way to master it all. Speaking as an iOS music production purest, it is my opinion and perspective that without a quality set of tools to master all that music from all those amazing apps, you’re just playing around. Not counting those who master on their computers. That doesn’t count. The Audio Mastering App has a 10 band EQ, Harmonic Saturator, 3 band Stereo Imaging, and a Loudness Maximizer with adjustable ceiling. Up to 24 bit processing, dithering, multiple file conversion options and more. This is an affordable, and quality tool. It just needs automation so adjustments can be made in real time. That wraps it up. I’m sure not everyone will agree with my “Best Of 2013” choices, and that’s OK. I considered many factors that are most important to me and that I think relate best to the iOS music production purest. As always, I am looking forward to the things to come in 2014! My biggest hope is to see a big time iDAW that does a good job of delivering the most complete, under (but not limited to) one roof production environment. This colorful new sequencer arrived in the nick of time. There weren’t a lot of new or innovative sequencers in 2013. It’s a surprisingly capable new sequencer. It looks like a toy, but it’s not. This is a very effective sequencer with bright future. There were some early hiccups, bugs and whatnot. Mr. Franke did a great job cleaning things up and released an update with loads of fixes and improvements. That’s encouraging. However, not enough yet as it is still lacking certain things, and suffering from some anti-intuitive procedures. Additionally as I dig in further this app is frustrating me to no end. Notably there are problems with sound selection, samples, and pattern or kit changing. Look out for my review where I’ll go into detail on the good, bad, and frustrating in the Janurary issue of “Apptronica”. NOTE: I had spent a lot of time with Stroke Machine prior to writing this and chose it for the “Best Sequencer”, but I was wrong on some crucial points I overlooked. Now that I’m really digging into this app as I write my review for Apptronica, I’m finding that there were big problems with this app , I had completely missed. Completely! A reader brought to my attention some serious flaws. Initially I dismissed his complaints and thought everything was fine. Nope. I was wrong. So Mark, wherever you are, sorry about that. I also thank you for not just letting it go. Stroke Machine is still something special and potentially huge. It just isn’t there today, or yesterday as I had originally thought. So I must do the right things. 1- Apologize to everyone for my error. 2- Give credit to Mark (see comments) for hitting me upside the head and waking me up. 3- Correctly apply a functionally superior app in the category of Best Sequencer where it truly belongs. As imperfect as it is. 4-Did I mention I’m sorry about my mistake? My biggest Musogasm probably came from Virtual ANS, which while something of a hoax, does extraordinary things to sounds, sending them to the bottom of the ocean in a rusty pirate ship, then back up to your iPad all haunted andbruised sounding! Weird. Great! Cheers, Smitey, and Happy New Year to you and yours! It just keeps getting better and better, both, the apps and the reviews! I wouldn’t have thought that Samplr and turnado would not end up on anybody’s list? It’s really not much of a mystery. You see the best of 2013 is about new apps released in 2013. Turnado and Sampler were both released in 2012, and they were both on the list for that year. I think Stroke Machine has amazing potential, but I really think you’ve jumped the gun giving them this much kudos. You must be basing it completely on it’s future potential because at the moment (even with the newest .01 update) it is still riddled with bugs. The pattern switching is horribly broken – a crucial feature for an app like this. Did you not try any of that when you reviewed this? Its working fine for me since the latest update. Nope. I was wrong. I had to delete my entire comment. I was mistaken. I became confused because of how Stroke Machine says in its manual that “Patterns are kits are patterns”. So I was ignoring the meaning you placed on those words and translating as the developer explained. I assumed you meant sounds, not entire patterns or kits as they appear in the app. I have no problem (mostly) with arranging different sounds throughout the patterns. However trying to load a completely different kit is indeed a whole other story. That said, and combined with new found frustration, I am reversing “Best Sequencer” and “Most Potential” selections. Working side by side with the two, “Electrify NXT” is vastly superior. Not perfect but it is far more useable than “Stroke Machine” as is today. I apologize for my error. You were right. I was wrong. I am editing my list selection as described to reflect this, and changing my selections in these two categories. Not to make an excuse, you were right plain and simple, but while trying to make sense of this I’ve been extremely frustrated by a crazy mixup with my doctor and medical insurance that had created a terribly frustrating distraction. Which clearly obscured my better judgement. Nevertheless, I accept responsibility for my error, and will correct it best I can. Yeah, they updated Electrify NXT and made significant improvements. I really like it. Plus it makes a lot more sense. Nothing confusing about it. I like that. I’ve heard about crashes still, but I haven’t had one yet. Stroke Machine is not bad, but it has some confusing aspects. Not nearly as intuitive as it’s billed to be. It has great potential though. I should’ve reviewed it first before selecting it. It’s been a crazy couple weeks. Ugh. Hey – thanks for the reply. I’ll still be watching Stroke Machine’s progress cuz I think it has great potential. Heck, you never know – a few more updates and it might be working perfectly. 😉 And yes, Electrify is also a worthy competitor. Interesting to see that they both came out about the same time, which might spur each dev to get the apps running consistently stable. You’re welcome. Thank you for giving me a smack. I really was too distracted by other things to properly respond. Sorry again about that. I make mistakes, and will always try my best to correct them.